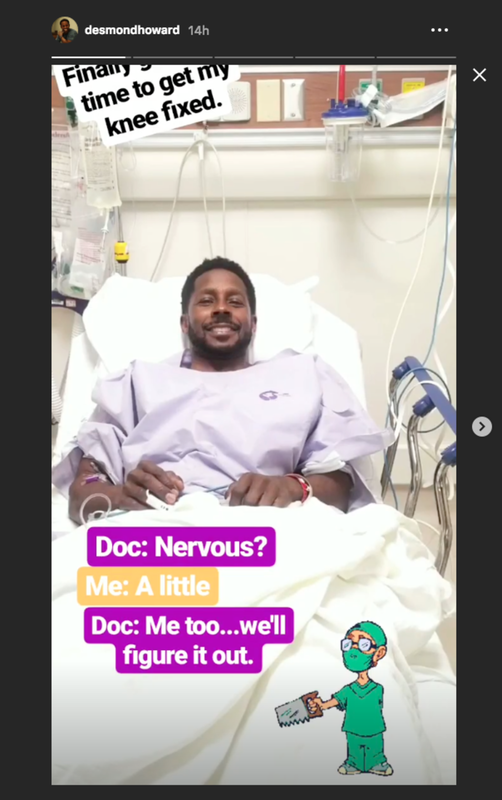 Former Michigan star and current College GameDay analyst Desmond Howard revealed this week on Instagram that he recently had surgery on his knee. It looks like he’d been putting it off for some time. It’s unclear when Howard suffered the injury – or if it’s just been lingering since his playing days. He documents his workouts on social media quite frequently, so whatever it is, it hasn’t hindered him too much. Howard’s story shows that he’s about to get into some Netflix shows/movies – including Bird Box. Howard is one of the stars of ESPN College GameDay – along with Kirk Herbstreit, Rece Davis, Lee Corso, David Pollack and Maria Taylor. Howard, after starring at Michigan and winning the Heisman Trophy in 1991, was the fourth overall pick by the Washington Redskins in the 1992 NFL Draft. While he didn’t have a stellar career in the pros as a wideout, he made a name for himself as a kick returner. He even won a Super Bowl MVP in 1996 when the Green Bay Packers knocked off the Pittsburgh Steelers. We wish the best to Howard in his recovery.